Poll figures released by YouGov yesterday show that 45% of people believe George Osborne should be replaced as chancellor of the Exchequer, with only 24% wanting him to stay. A dip in popularity was expected following the Budget announcement earlier this year, but Osborne has not been able to recover from credibility damaging U-turns, accusations of stifling growth and criticism from the IMF and his own backbenchers. When YouGov asked those surveyed who should replace Osborne as chancellor, Vince Cable came in as favourite with 22% of the vote, tailed by William Hague (16%) and Ken Clarke (9%). If George Osborne hoped that he would spend only a few awkward, post-Budget weeks navigating his sea of troubles before reaching calmer waters, YouGov’s latest poll for the Sunday Times will come as a shock. Just 15% think he is doing a good job as Chancellor – the same dire figure we found in late June, and less than half the 34% we recorded at the time of last year’s Budget. Only 20% think David Cameron should keep Osborne at the Treasury – even less than the 24% we reported in late June. And now, as then, fewer than half of Conservative voters want him to stay on as Chancellor. However, the chances of Osborne being dropped as chancellor are slim. Regardless of how questionable his track record has been, the decision to axe him from the role could be even more damaging for Party credibility than his prior actions. George Osborne is for the chop but his economic policy will remain in place. That is the lesson to be inferred from the sudden spate of newspaper articles announcing his imminent departure. If it were simply a matter of the odd piece in the Observer or the Guardian, one could dismiss it as wishful thinking, but when theMail on Sunday goes for the jugular, something serious is happening. Here’s a possible Tory scenario: after further bad news from the IMF and others about the economy and a possible downgrading of Britain’s AAA bond status before September, Osborne swaps places with William Hague who becomes the new chancellor. The fact that the Tories have been sliding downhill ever since the April budget fiasco is not yet a reason to celebrate. Cameron has a viable and potentially winning game plan once again. Labour must have a better one. Former chancellor and Tory peer Lord Lawson was more subtle with his criticism, saying that Osborne should give up his role as chief strategist to focus on his role as chancellor. Shadow chancellor Ed Balls has accused Osborne of being a “part time chancellor”. 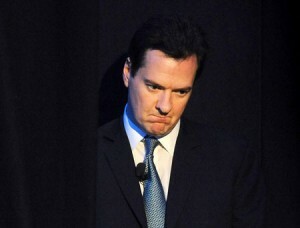 After a string of errors by the chancellor, his replacement would give opportunity for smug celebration from the Left. But as Irvin mentioned previously, replacing Osborne could benefit the Tories and improve their chances of winning again in 2015. A real victory against the greedy green, rent seeking corporates. Well done George! The Chancellor has demanded that the Energy Secretary Ed Davey abandon the UK’s pathway towards climate targets. This is excellent news for people on low fixed incomes. More gas exploration means gas prices will fall. The climate targets made no sense at all as the major CO2 emitters China, USA and India refused to pass a climate law putting jobs and their economies first. Possible shortterm gane for certain longterm pain if you ask me, Fay. How is it excellent news? There won’t be any “more gas exploration”, given the punitive smash and grab on the North Sea revenues, no company will touch it with a barge pole. No, this is betting that your 1% won’t force gas prices up, a bet no gambler worth his salt would take. The BRIC’s are heavily investing in nuclear energy, and a climate tax structured like VAT could easily prevent countries from passing the costs around. We should drop “renewable obligations”, yes, in order to build a new generation of nuclear reactors. Not gas. Is there something wrong with the headline here? When I learnt maths, 45% wasn’t a majority.